Good comments about the architecture and the house decor, Gord. There's a second fish sculpture by Sascha Brastoff on the back patio as well. I wondered just how different the floor plans of the matte painting and the blueprints really were, so I created a "cleaned up" version of the blueprints to make it easier to see the actual walls and a few related features of the house without having to wade through all the notations and small details the blueprint includes. The green lines on the right side of the living area are just my estimates for where those walls (which weren't included on the set) would be if the house were complete. The image above has a link to a 1,973 pixel version so you can look closely at the info I left within the walls. I was careful to rotate the blueprint to the same position as Wayne's version, with the POV at the very bottom so that it matched the matte painting. After creating this simplified version of the blueprints, I tried to figure a way to create some kind of "partial fit" between the the blueprint and the matte painting, but it just isn't possible. 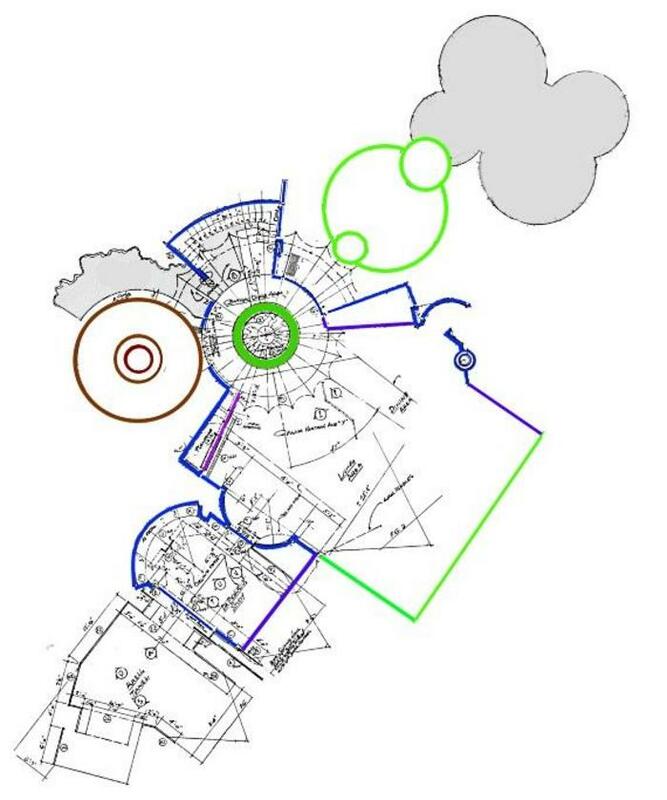 The relative positions of the dome and the first floor structure are too different. 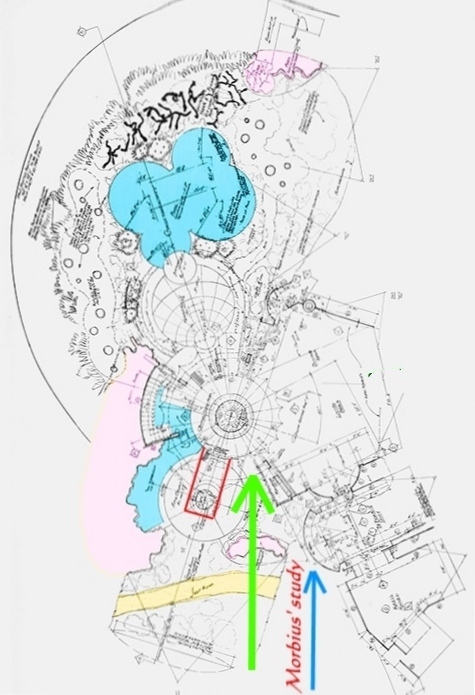 There's also the fact that the matte painting has features not found in the blueprints (the extension, the overhang between the two levels, the wing near the pool), and the blueprint has features not found in the matte painting (the pool patio, the living area / Morbius study configuration, the forecourt). That, of course, is why Wayne wasn't able to match up any features from the parts of the house that aren't within the dome. I realize that some of these are absent in the matte painting simply because of the angle from which the house is viewed. But most of them are just extreme differences between the two that make it impossible to match up the two structures (other than the dome features), no matter which way you turn the blueprint. Wayne's estimation of the dome's circumference seems very reasonable. In his earlier version he left a gap in the dome to explain why there was no shadow over the forecourt. Note to Wayne: Since the set is lit by studio lights which don't really duplicate direct sunlight, and since the camera is careful never to reveal anything above the point the set is intended to show, I'd be willing to accept the idea that the dome was suppose to be above the forecourt. But naturally we just never get a shot that would have revealed it, even if the set had included the bottom of the doom above the forecourt. Yesterday I confessed to Gord in a PM that I made the simplified floor plan because I suddenly realized that the facing wall of the house at the ground floor in the matte painting only had a very slight curve to it — much less than the dome above it. So, for decades I had mistakenly assumed the "dome" went all the way the ground at that portion of the house. That's why I kept insisting that you couldn't put a dome-shaped structure that covered a rectangular house. Silly me, the ground floor is comprised of rectangular areas, and the dome (which is smaller) sits on top. I modified the jpeg below to line up the bottoms of the windows and show that the wall is completely straight. I really didn't have to change them very much. I now realize that the dark area below the windows is just the shadow of the curved overhang above it, so it really should be curved, both on the wall and on the ground. But straightening it below the windows helps to illustrate that the wall itself is not curved. Guys, if you've known this all along, please don't even tell me! I already feel foolish for not having realized this before. However, in my own defense, Gord's closeup of the house is the sharpest version I've ever seen — and even IT was very dark until I enhanced it with Paint.net! The fuzzier versions of the matte painting we've all seen for years tend to mask that aspect of the house's design, even when they're cropped to bring the house closer. Gord told me he bought a print from a seller on eBay. I'll be bet he could actually sell prints of the improved version and make his money back several times over! I think part of the problem is we look at it from an engineering, draftsman's point of view while Bud views it from a more emotional point of view. 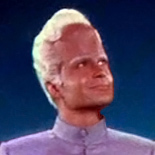 You and I see that the matte painting and most of the filmed perspectives as being in accord. He sees where they vary in minute degrees from the actual set. Something else occurred to me overnight regarding the curved flight of stairs being open to the sky, as I drew in the alignment diagram. I forgot about the flat "patio cover" apron around the dome at the point where I drew the dome's circumference. That would cover the stairs! Duh! And further thoughts about the lack of shadow on the forecourt from the dome overhang... As Bud pointed out, the various departments working on the film had their own specific focus. Since the floorplan didn't go into any second floor detail, the only thing the lighting crew (and I guess, the Director of Photography) had to go by in lighting the forecourt was the open radial rafters covered with china silk, and nothing above that. Therefore, no shadow cast by a dome. The sets that were open on the near lower-right side -- Morbius' Study; Living Area/Dining Area; Krell Tunnel -- might not actually extend as far out on the "actual" house as the walls are drawn. The lengths of the walls toward the open ("fourth wall") side might be solely for freedom of camera positioning. They could pull the camera farther back for more coverage without fear of running out of side walls. (Bud closed off Morbius' study on this side narrower than the extent of the walls as well.) I'm also curious about the notation, "Wall Doubles" just below the Living/Dining areas. What does that mean to a cinematographer? Lastly, in defense of Gord's reference to axes of the house, the floorplan does reference a Major Horizontal Axis "X" and Major Vertical Axis "Y". Like you said, guys, I'm the one who approaches the subject "emotionally" (which I hope refers to my modest artistic skills). So, consider these questions from All Sci-Fi's resident artist in our brilliant trio! In other words . . . what if he'd rendered the painting like this? ~ Click on the jpeg to see the 1,600 pixel version. Beautiful picture and it makes more agreement with the actual blueprint. As I was reading your "what if" section, before I scrolled down to the modified painting, I began thinking, "Bud needs to apply his artistic skills to create his own version of the matte painting." Whatever cliff or formation the Krell tunnel disappears into. In addition, we're seeing too much of the far pool. Only about half of it would be visible from this direction. You've cut your own work out for you, Bud. Let's see what you can really do! However, some of the details you described would barely be visible, and I wasn't really trying to make the painting completely accurate, just closer to the blueprints in three key ways: the main entrance is the driveway canopy, the house does connect to a cliff, and the pool is correctly positioned in relation to the main entrance. I actually tried adding some of the landscaping to the far side of the pool, but it didn't look very good, so I went with the bare ground, which at least doesn't have a "patchwork" appearance, way the stuck-in vegetation did. But I might take another shot it in a few days. You're right that the pool is too far to the left (and a bit too high), causing more of it to show than if it were placed more accurately. But remember, I initially suggested that the artist deliberately relocated the pool to the right side because he didn't want it obscured by the house. I just wanted to compromise by putting it "closer" to the right place, without hiding too much of it. So yes, I definitely cheated a little. But my "artistic license" hasn't expired yet, so I can do stuff like that. Just out of curiosity, what did you mean by this? "The living/dining area, Morbius' study, and Krell tunnel entrance (a second extension to the right of center, even larger than the "breezeway")." If you mean that I should actually paint in a new structure and put Morbius' study in the right place relative to the main entrance, that would be little like giving Barbra Streisand a nose job! The painting has its technical flaws, but we still love it (warts and all, as the say), so I just tried to "rearrange it" a bit, not extensively "repaint it". Also, Wayne, I'm not quite clear about what you meant by the statement below. "Whatever cliff or formation the Krell tunnel disappears into." The "wing" on the right is supposed to connect to the cliff. Should I change it somehow to make that more apparent? If so, what change would you suggest? Is the rock around the part of the house against the cliff too dark? I could easily bring the "rock texture" down to replace the dark area, if that would help. I thought the dark rock might be a good way to call attention to the connection, but if that isn't working, I can change it. 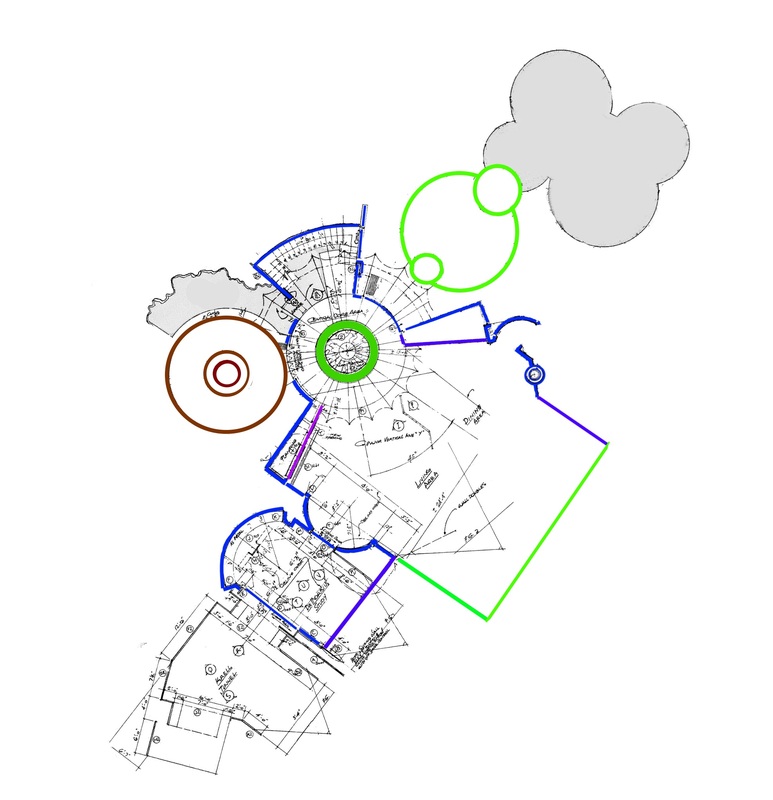 According to your orientation of the floorplan, establishing the Point of View, the wing of the house on the right that contains Morbius' study and the entrance to the Krell tunnel should be extending toward us on the near side of the dome, rather than away from us on the far side. It would be similar to the driveway canopy, but larger and mirrored to the right of center instead of the left. It would also have to disappear underground (like into a cliff face) no later than the entrance to the Krell tunnel, since nothing constructed above ground by the Krell remained. But if you're falling back on "artistic license" to rearrange the floorplan entirely, then anything goes and your version of the matte painting will be even less accurate than the original you're criticizing for not being accurate. With respect, sir . . . you just don't get it. The altered painting assumes we're looking at the front of the house, not the back, based on the fact that the artist placed a driveway canopy on the facing side. The POV in the painting is just to the right of the driveway canopy / main entrance. The painting appears to have the living room and the study on the far right of the house, and I'm not trying to fix that. I didn't rearrange the floor plan, Henri Hillinick did. The preproduction plans and the blueprints have the house joined directly to a cliff. One of the preproduction sketches did this with a section of the house extending to the cliff. Henri didn't bother with the cliff connection, so I fixed that. I just changed the painting to show that the right side of the house did in fact join with the cliff, making the section on the far right similar to the two pre-production sketches which show the house joined to the cliff in some manner. That's the most likely spot for Morbius' study in Henri's drastically different version of the house. It actually IS on the other end of the house, opposite the two entrances and the pool, which is consistent with the floor plan in that one regard. I'm not asking you to agree with my interpretation. In fact, I wasn't even expecting you to. No, I guess I don't get it. It just sounds to me like you're making the matte painting more incorrect than it is by building on a collection of unwarranted assumptions. Maybe that extension is the carport where Robby parks his "Jeep" ! Krel (David) suggested that too in his PM. That seems reasonable. In fact, it almost looks big enough to be a front entrance canopy and the carport for Robby's hot rod! "I have NO DOUBT that Henri Hillinick 's intention was to paint the front of the house and he did so based on what data he had at the time. My whole point was that as painted the pool was on the wrong side and he didn't show the entrance as it was shown in the film. The only way that could be resolved was if it was the back/side of the residence and I extrapolated how the two elements (painting and set blueprint) could be resolved. I was going for a reasonable conclusion that verified both interpretations (a "mash-up, as it were). Both are beautiful works of art: One as a visual representation, the other a draftsman's masterpiece.. Your (Bud's) revision of the painting corrected most of my objections. I'm sure that the painting as shown in the film was only meant to be a fast suggestion of what the area looked like with only a few seconds of screen time. If we tried to analyze the mattes in THE TEN COMMANDMENTS or any other film we could find all kind of inaccuracies as well. I think the pool and entrance area are in fact a bit lower than you do. You (Bud) feels the entire building is on a level plane while I feel that it is built with the "back" (Your side) embedded in either a sheer rock ledge (about 8 ft high) or in a slope rising to the level in the paintings foreground. This would account for the rock faces shown on the set and accomadate the rocky area that the Krell tunnel descends into. Perhaps what I should do is construct a scale model diorama of my concept and photograph it to illustrate my idea. (Hum...Now there's a challenge I just may do. My Brother-in-law is an architect and has all kinds of model stuff.....Maybe I'll do just that!). Our love for this movie drives us to do this. We strive to draw reality out of illusion. I think You, me and Wayne have done exactly that in our own ways. 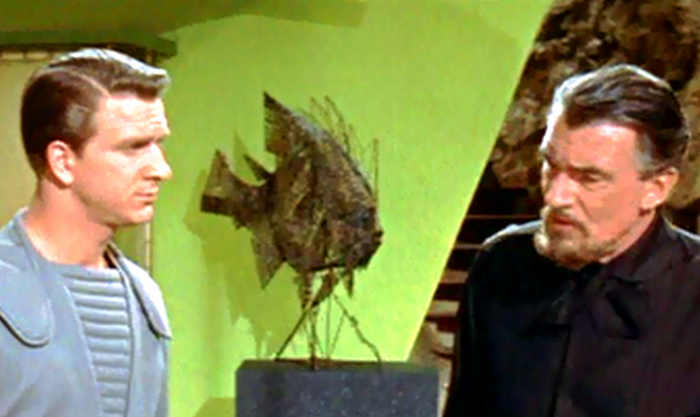 It would be helpful if M-G-M did not destroy the original maquette (a model or mock-up) of the sets that are made for every set in ALL movies since virtually the beginning of the motion picture industry; or if there are any pictures of the set maquettes of Forbidden Planet. Hmmm; Maybe Bud should contact Bill Malone and ask him? Maybe Bud should contact Bill Malone and ask him? Unfortunately, Bill doesn't appear on my friends list anymore. I must have asked him too many questions. I'll bet he gets a lot of pests like me. He hasn't answered my LAST question from 2014! But what the hell, I sent him a message anyway.